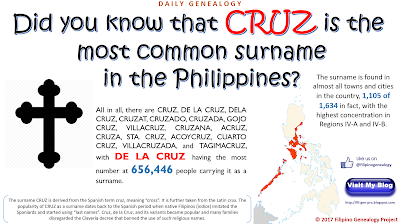 Did you know that CRUZ is the most common surname in the Philippines? The surname CRUZ is derived from the Spanish term cruz, meaning “cross”. 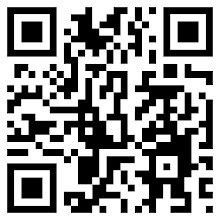 It is further taken from the Latin crux. The popularity of CRUZ as a surname dates back to the Spanish period when native Filipinos (indios) imitated the Spaniards and started using “last names”. 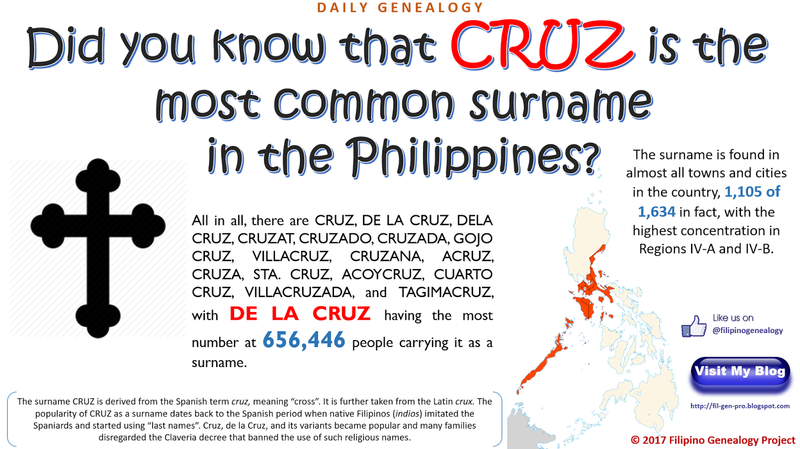 Cruz, de la Cruz, and its variants became popular and many families disregarded the Claveria decree that banned the use of such religious names. All in all, there are CRUZ, DE LA CRUZ, DELA CRUZ, CRUZAT, CRUZADO, CRUZADA, GOJO CRUZ, VILLACRUZ, CRUZANA, ACRUZ, CRUZA, STA. CRUZ, ACOYCRUZ, CUARTO CRUZ, VILLACRUZADA, and TAGIMACRUZ, with DE LA CRUZ having the most number at 656,446 people carrying it as a surname. The surname is found in almost all towns and cities in the country, 1,105 of 1,634 in fact, with the highest concentration in Regions IV-A and IV-B.